Introducing the latest member of our sportbike family: the all-new 2019 CB300R. And along with it, we’re embracing a concept that’s long been one of motorcycling’s best-kept secrets: the lightweight sport roadster. Light, nimble, and most of all a blast to ride, the CB300R is full of innovative engineering to make riding fun. Best of all, it offers the kind of refinement and quality—including available ABS—that you only get from a Honda. Ride it and see! The CB300R's frame—which helps underpin its minimalist style and is drawn on the same Neo-Sports Café aesthetic as the new CB1000R—is constructed from high-tensile steel tube and pressed steel, with the steel pivot plate now separated from the main frame. Through this design, the main frame between the head and seat rail is now free from the stress applied to the rear wheel, which enabled each piece to be optimized in terms of strength and profile, primarily through the use of thinner steel pipe and steel sheet. While offering optimized strength, the main frame is now lighter weight. A new swingarm offers similar rigidity and performance benefits, with increased thickness at the cross member but tapered wall thickness toward the new, hollow rear axle for ideal flexibility. Newly designed, lightweight aluminum wheels share the same design as those in the rest of the CB lineup, ultimately aiding in the bike's nimble handling characteristics. A 41 mm inverted fork with compliant damping and supple spring rate is pared to an updated single shock offering seven-step spring-preload adjustment. A 49.6 / 50.4 front / rear weight bias provides a positive feel for front-end grip and easy steering, which is also helped by the low, 313 pound wet weight (317 pounds with ABS) and compact 53.3 inch wheelbase. Seat height is 31.5 inches. Stopping power comes courtesy of a 296 mm floating front brake disc paired with a radial-mount Nissin four-piston caliper, and 220 mm rear disc matched to a single piston caliper. 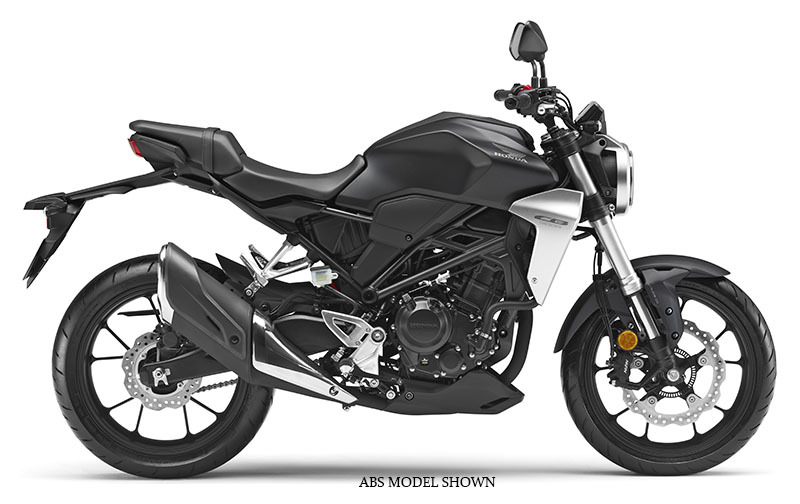 On the CB300R ABS, both brakes are modulated by two-channel ABS that works through an inertial measurement unit (IMU) to give precise front-to-rear distribution of ABS operation, depending on vehicle behavior. Dunlop radial tires—a 150 / 60R-17 at the rear and a 110 / 70R-17 at the front—are standard. To help achieve nimble handling, parts near the vehicle's periphery have been designed to be lightweight, while many of the heavier components (including the engine, muffler, rear shock, battery, and ABS modules) are laid out to provide an ideal center of gravity. Styling is a deliberate reduction, putting the machine's blacked-out hardware on display. It's also brutally neat and brings a new hard-edged attitude to the naked-bike scene. The cutaway tail unit is barely there, though it supports separate rider and passenger seats plus the nylon rear mudguard mount. Rider and passenger foot-peg hangers are aluminum. A lightweight, full-function LCD instrument display is nearly 60% thinner and provides simple readouts for speed, engine rpm, fuel level, and gear position, with warning lights arrayed across the top. Full LED lighting—including turn indicators—adds a premium feel and contributes to improved mass centralization. The headlight uses a dual-bar light signature—upper for low beam and lower for high beam—and the taillight is the thinnest ever mounted on a Honda motorcycle. Family genes abound, as the fuel tank also shares the same basic motif as the CB1000R. Attitude. Bore and stroke are set at 76 x 63 mm, with a compression ratio of 10.7:1. PGM-FI fuel injection—with 38 mm throttle bore and a refined, straight-shot intake path—delivers crisp throttle response across the rev range. The exhaust is underslung, and its dual-chamber muffler exits on the right side; reduced air resistance contributes to an ultra-linear throttle response. The CB300R's compact 286 cc DOHC four-valve, liquid-cooled, single-cylinder engine (shared with the CBR300R) is a diminutive jewel that has won many fans for its free-revving, responsive nature. And while that free-spinning character can get the adrenaline pumping as revs rise, the engine also works well in real-world road-riding conditions, both around town and out on the highway. The engine is also designed with the minimum number of moving parts. Details like low-friction piston rings, high-density core radiator and iridium spark plug help increase fuel efficiency. Thanks in part to the weight-saving measures and the new intake layout, initial acceleration has been improved by 4%.